Parents get to play with the coolest toys of all. Of course, we're talking about our phones. They're basically toys for working adults and we love to waste time on them. But if you look back on the greatest time in your life you probably weren't tapping a bunch of apps on a tiny, magical (and expensive) tablet. No, you were a kid without a care in the world, running around in the back yard pretending you were the greatest pirate who ever lived. No in-app purchases on the horizon.... just adventure, daring, and a whole lot of glittering loot! Remember when you did this? We do. In fact, we sort of made our living out of it. Imagination takes all of us wherever we want to go. Our own creativity is the limit, and we can tell you that everyone's creativity, when explored, is humongous. Gargantuan! We love encouraging kids and parents both to come up with swashbuckling stories of heroism, mystery, intrigue, and tons of carefully choreographed (toy) sword play. 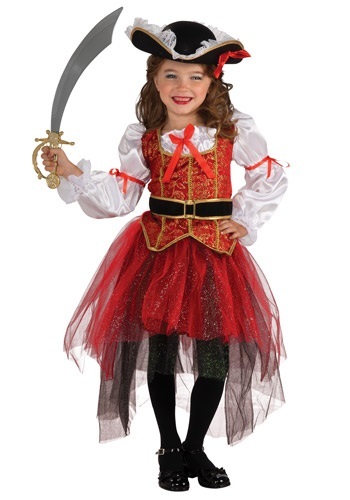 Yes, Halloween is one of the best times to encourage your child to dress up and explore their world with imagination. For instance, check out this awesome Sea Pirate costume for girls. She will be ready to relieve the neighbors of their delicious candy, and when she is all hopped up on candy for the next few days you can both build pirate ships out of those building bricks that shall not be named, and conduct (toy) sword fights on the brig of her trusty ship AKA as the couch in the living room. Finally, when you are both tuckered out from a days of playing together you can relax on the couch. She'll be watching old pirate movies on TV, and you'll be watching the wonderful memories from that day playing in your head once more as you enjoy a much deserved nap.